ARM has announced that it is previewing a new microarchitecture. The DynamIQ microarchitecture is claimed to be the most flexible and versatile yet as it goes beyond ARM's big.LITTLE (introduced in 2011) with the ability to mix different types of cores in the same cluster. Let's recap where we are today in ARM processor design. Commonly nowadays smart devices ship with multi-core ARM processors in big.LITTLE configuration. Within a typical octa-core SoC the 8-cores will be split into two quad-core compute clusters; one consisting of beefy powerful ARM cores, the other block consisting of lower power, high efficiency ARM cores. The idea is that when processing power is required the beefy ARM processor quartet will come into play. Meanwhile, when your smart device is taking it relatively easy, it can switch to using the 'lite' cores for its background tasks and so on - saving energy. ARM's new DynamIQ microarchitecture hones the above 'right processor for the right task' approach to its logical conclusion. For example, with the new microarchitecture, processor designers will be able to create 1+3, 2+4, or 1+7 DynamIQ big.LITTLE configurations and more. According to ARM the new architecture thus delivers "substantially more granular and optimal control" in SoC design. Multi-core flexibility as outlined above can be as flexible as an SoC designer desires. 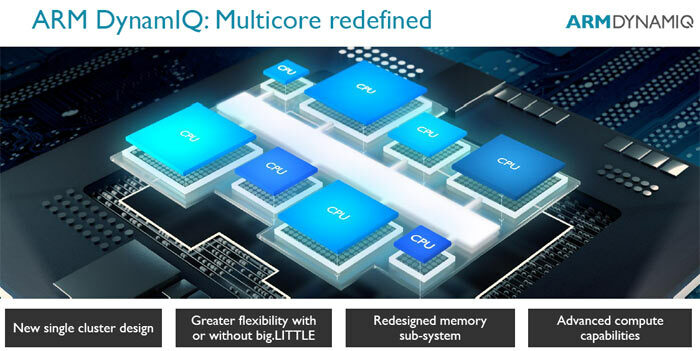 ARM says that a DynamIQ processor could contain up to eight cores per cluster with all eight cores possessing different performance and power characteristics. Greater responsiveness for ADAS (Advanced Driver Assistance Systems) solutions for greater safety. ARM boldly claims that the next 100 billion ARM-based chips will power forward thanks to DynamIQ big.LITTLE and the 'total computing' approach embraced by the company. Hopefully the seemingly vast and complex range of options that will become available to SoC designers and consumers won't deliver any painful pitfalls.